The last major undisturbed area of rainforest in Sri Lanka, this forest reserve occupies a broad ridge at the heart of the island’s wet zone. On most days the forest is shrouded by copious rainclouds that replenish its deep soils and balance water resources for much of southwestern Sri Lanka. Recognising its importance to the island’s ecosystem, Unesco declared the Sinharaja Forest Reserve a World Heritage Site in 1989. Sinharaja (Lion King) is bordered by rivers: the Koskulana Ganga in the north and the Gin Ganga in the south. An old foot track that goes past the Beverley Estate marks the eastern border, close to the highest peak in the forest, Hinipitigala (1171m). Towards the west the land decreases in elevation. The reserve comprises 189 sq km of natural and modified forest, measuring about 21km east to west and 3.7km north to south. It was once a royal reserve, and some colonial records refer to it as Rajasinghe Forest. It may have been the last redoubt of the Sri Lankan lion. In 1840 the forest became British crown land, and from that time some efforts were made toward its preservation. However, in 1971 loggers moved in and began selective logging. The logged native hardwoods were replaced with mahogany (which does not occur naturally here), logging roads and trails snaked into the forest and a woodchip mill was built. Following intense lobbying by conservationists, the government called a halt to all logging in 1977. Machinery was dismantled and removed, the roads gradually grew over and Sinharaja was saved. 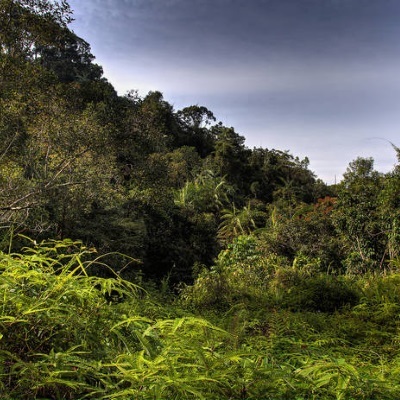 Much of the rest of Sri Lanka’s rainforest stands on mountain ridges within a 20km radius of the forest. There are 22 villages around the forest, and locals are permitted to enter the area to tap palms to make jaggery (a hard brown sweet) and treacle, and to collect dead wood and leaves for fuel and construction. Medicinal plants are collected during specific seasons. Rattan collection is of more concern, as the demand for cane is high. Sinharaja attracts illegal gem miners, too, and abandoned open pits pose a danger to humans and animals and cause erosion. There is also some poaching of wild animals. The drier months (August and September, and January to early April) are the best times to visit. Hinipitigala stands for most of the year under drizzles and downpours. Sinharaja receives between 3500mm and 5000mm of rain annually, with a minimum of 50mm in even the driest months. There’s little seasonal variation in the temperature, which averages about 24°C inside the forest, with humidity at about 87%.